Yesterday was a bad day. I was up half the night with a sick toddler, and then that same child decided to be up for good at 4:30 am, foiling any attempt of getting in my usual morning prayer time. The sleep deprivation and the rush to get my other kid to school on time had me yelling and fuming in a way that I am ashamed to recall. The rest of the day spiraled down from there. That afternoon, when I finally had a few minutes to myself, I felt the Holy Spirit nudging me to make up my missed prayer time. I read through the readings for the day, but was distracted and tired. I had missed my morning prayer time, the day was already a train wreck, and it was too late to get it back on track. I reached for the TV remote, deciding that prayer time just wasn’t going to happen that day. But then I felt it again, that gentle nudge of the Holy Spirit saying, No, try again. So I turned off the TV, closed my eyes, took a few deep breathes, and invited Jesus into my heart. And He came! He came into my messy living room, into my tiredness, into my day that I thought was too far gone, and filled my heart with the peace it so desperately needed. Isn’t that often how God works? He comes when we don’t expect Him to, and sometimes, when we don’t want Him to. He uses a boy with a slingshot to slay a giant. He heals the man with the withered hand on a day that was culturally inappropriate and in a place where He raised a lot of eyebrows. That’s because Jesus doesn’t want to fit neatly into the times and spaces we have allotted for Him. He wants more for us. He wants to astound us and shatter our expectations of what He’s capable of. But in order for that to happen we have to have hearts that are open. I don’t want Him to be grieved at [my] hardness of heart. (Mark 3:5). I want a heart that is soft and ready to bend to whatever His will for me might be. 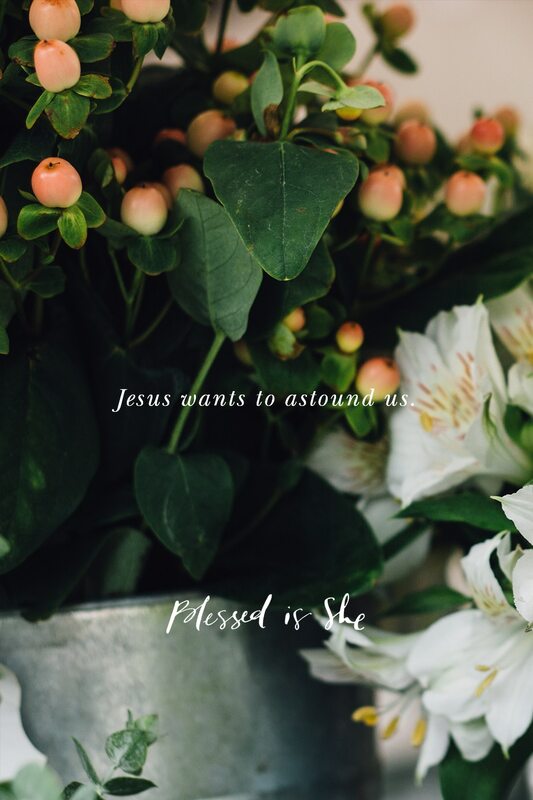 Jesus wants more for us. He wants to astound us. Anna Coyne is a Saint Paul native, wife, mother, and convert to the Catholic faith. When not chasing after her two young children you can probably find her playing the piano, knitting, tripping over wooden train sets, or writing. Find out more about her here. This is excellent. I just found out about this website. Thank you for this. It’s just what I needed. Blessings to you. As a type A mom of 4, I love schedules and plans being in order and tend to give up on the gym or prayer if it doesn’t happen in my timeline. Thank You for this well written reminder! Beautiful, inspiring! Thank you for sharing such a real and honest insight. Thank you for writing this its exactly how I felt couple of days ago he definitely shows when we least expect it.. that’s how I explain the love I know he has for me..for all of us..A joy and peace that bursts for my heart. Hope your child is better God Bless. ? ?